Because of the high levels of variability that are present within a hospital, it is important to make every effort to provide patients with a positive experience, reduce wait times, increase efficiency and effectively utilize resources and staff. Simcad Pro Health is a sophisticated simulation engine that can be utilized to improve the overall efficiency of a hospital. Simcad Pro Health has been shown to improve staff allocation and layout of the hospital to increase efficiency of care without having to sacrifice the quality of administered care. 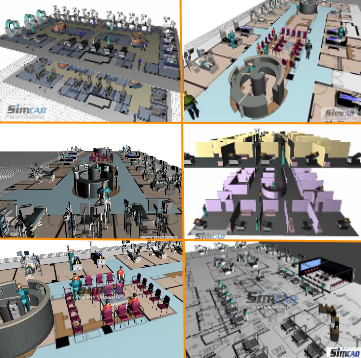 Using Simcad Pro Health's patented dynamic simulation engine, many different personnel have the ability to perform analysis, detect delays and bottlenecks, provide feedback and suggestions through annotations on the model, and provide viable solutions with ease. Because of the ease of use of Simcad Pro Health, the simulation technology is brought to everyone involved and facilitates the main concepts of lean thinking in the hospital. 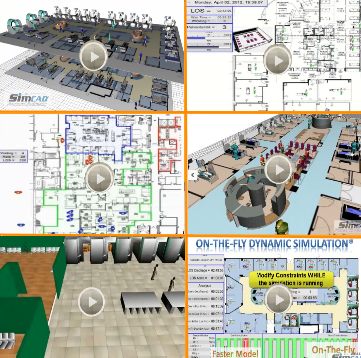 Through the different features of the dynamic simulation engine, Simcad Pro Health users can perform "what-if" scenarios, virtually modify the operation (change the number of available rooms. vary the staffing levels, modify patient needs, change the layout of the hospital, etc…) and visualize the effects of such changes on the overall efficiency and performance of the hospital. “On-the-fly” changes to the simulation reduce the time needed to do analysis of the model and cut down on the time needed to find the optimal solution, therefore saving the hospital money. Due to high variability of patient needs, arrival times and other factors Simcad Pro Health has the capability to utilize live data (EMR systems, RFID, etc…) and historical data to supplement the mathematical distributions learned from the operation. Users can retrieve live or historical data from the simulation and perform necessary analysis in order to optimize the hospitals functionality. Importing CAD layouts of entire hospitals allows the users to see actual travel distances for staff and patients. Changes can be made to the layout within the simulation to see how different placements of rooms, travel distances, etc… can improve the overall productivity of the hospital. How to improve, optimize, and schedule in Hospital with On-The-Fly Interactive Dynamic Simulation. View additional videos of healthcare modeling, simulation and optimization. I want to start working with Simcad Pro Health. No limitations on model size. No disabled features. Optimize patient flow, scheduling, bed turnover, ED/ER, OR capacity planning.